Wildling is the name of our sailing catamaran. 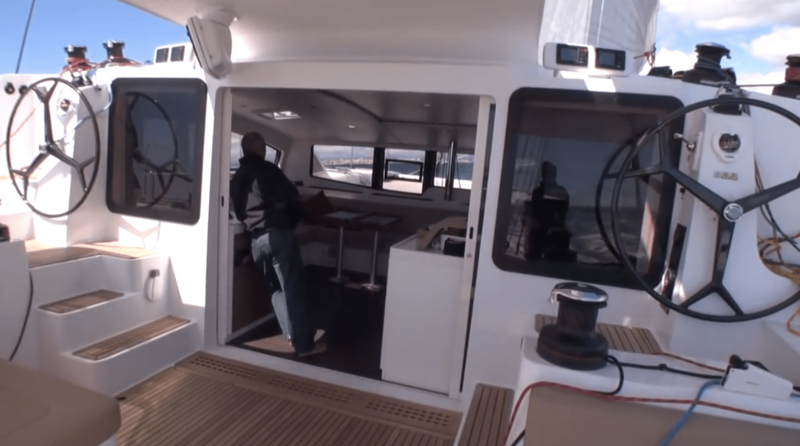 She is a 59′ Outremer 5X built at the Outremer factory in La Grande-Motte, France. After spending the past 4 years sailing a Catana 471 catamaran, we’ve really come to learn what we value most and what things our previous boat did well and not so well. So given the opportunity to have a blank sheet of paper for our next boat, we had to decide on the important features that our new boat would need. For me, the most important things are performance, security, and reliability. I really enjoy sailing, and sailing fast is a passion for me. I like to push the boat and know that it can handle the conditions safely and comfortably. I learned the hard way that at sea, complexity is the enemy. Systems that are too complicated will fail and always at the worst times, so keeping everything as simple as possible is really important. Robin is not too concerned about performance, but she does want the boat to be comfortable and safe. She really enjoys cruising and entertaining, and loves being at anchor in exotic locations. She wants plenty of space, good storage, a practical layout, and of course some luxury and conveniences. So we had to go in search of a boat that would meet both our criteria. Boats are like cars, in that it’s just as hard to find a really comfortable sports car, as it is to find a high performance RV, and the catamaran market has evolved to a point where almost all the production boats today are focused on the charter market, i.e. they’re more in RV mode. The charter market is focused on people that want to fly in to an exotic location, hang out and entertain their friends on board in comfort while they visit a few islands and then fly home. High performance sailing is not required, and in fact adding more performance is a negative because it increases the likelihood of something breaking. This Lagoon 52 is a good example of an excellent charter boat. Lots of flat surfaces for people to hang out, and plenty of shared seating areas. Driving from the top deck looks like fun too! The Lagoon in the picture is an example of the catamarans aimed at the charter market. They are designed around accommodation, roominess and entertaining at anchor. They are also heavy and slow. We like the comfort, but don’t like the poor performance. Notice how the 5X is more streamlined. The lower salon roof has minimal wind resistance, and the bottom of the mainsail is about 6 feet lower to the water than the Lagoon. This allows for a bigger mainsail, more power, and more speed. The 5X is an amazing design accomplishment for Outremer. It is comfortable, can be sailed by two people, is safe in extreme offshore conditions and very fast. So fast in fact that it will sail at almost the same speed as the wind. For example, if it’s blowing 9 knots, the 5X can sail at 8-1/2 knots. If it’s blowing 20-25 knots, it can do 18 to 20 knots. This is more than double the speed of typical production catamarans. The key to this level of performance is hull design and weight. They have made the hulls longer, but kept the living areas a similar size as you would find on a 52 or 55 foot boat. This makes it lighter, narrower, more streamlined, and able to carry more sail area, and so develop more power from the wind. To give a sense of the weight differences, the 52 foot Lagoon in the picture above weighs 26,000 kg (57,000 lbs). The 5X weighs 13,500 kg – about half the weight and has roughly 1/3 more sail area. It’s a long way down! The mast on the 5X is made of carbon fiber to save weight. It’s also 87 feet high, which seems crazy, but is actually 3 feet less than the Lagoon 52! It also turns out that interesting things happen when a catamaran approaches 60 feet in length. The sea motion becomes much less, giving a smoother ride, which is faster and more comfortable. By keeping weight out of the ends of the boat and having a carbon fiber mast with Kevlar rigging, instead of aluminum and stainless steel, the boat doesn’t pitch as much, so it’s smoother, more comfortable and once again, faster. Notice the long forward section of the hulls. These act just like the long skis that downhill racers use, or those long, big-wave surfboards. When a sailboat is traveling at 20 knots, the long forward hulls prevent pitching and nosediving. In fact, the design team for the 5X is VPLP in France. The same people that designed the catamaran that Team Oracle sailed to win the last America’s Cup, so they know a few things about how catamarans behave at high speed. The other significant design difference between a performance, offshore catamaran and a charter oriented catamaran is the helm position. The 5X has dual helms at the forward area of the cockpit at deck level. These provide good visibility and shelter in rough seas and rain, and allow the helm person to keep in contact with the folks inside. The 5X cockpit. Good access, plenty of visibility and shelter, and safe to move around in big seas. 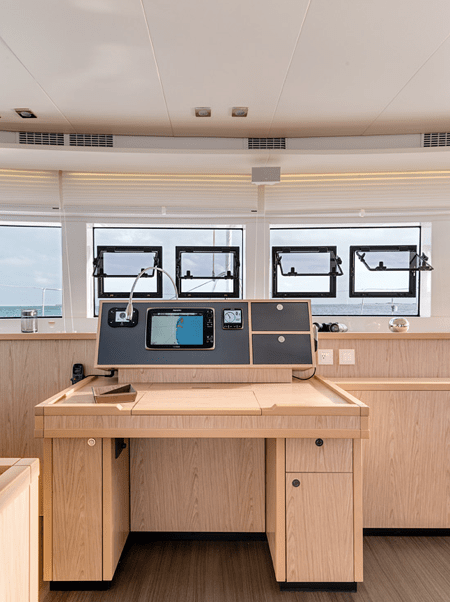 The Lagoon has a flybridge design for the cockpit which is elevated above the deck. It’s cool for tooling around in nice weather, but I would never want to be up there in the middle of the night, with 12 foot seas, 30 knots of wind, rain and breaking waves! The Lagoon “flybridge” cockpit is great for hanging out with friends in paradise, but no place you want to be when you’re trying to get there! The 5X is definitely fast, and safe for offshore passages, so I’m pretty excited! But what about Robin? Let’s take a look at the interior of the 5X and see how it compares to the luxury accommodation of the Lagoon. The Lagoon salon. Fitted out like a luxury condo, is really comfortable and perfect for entertaining at anchor. The interior fitout on the Lagoons is really nice. At anchor, it’s hard to beat. The large vertical windows give excellent visibility, and protect from the sun. The downside, (aside from a disconcerting IKEA feel) is all the angles, obstructions, sharp edges and corners. If you go sailing offshore, I promise you will never look at the interior of a boat the same way again. At sea it gets rough. We’ve sailed in 4 to 5 meter (12 to 15 foot) seas, a number of times, and trust me, everything is moving! You can not walk two steps without holding on. When you’re worn out from being on night watch for 6 hours, and your crew is too seasick to take the next watch, you don’t want to be trying to dodge all of those sharp edges, poles and obstacles. The 5X cockpit and the salon are all on one level with 6′-6″ headroom throughout, so no stairs. We had steps down into the salon from the cockpit of our Catana, and had to duck to enter. It was the cause of several accidents at sea. 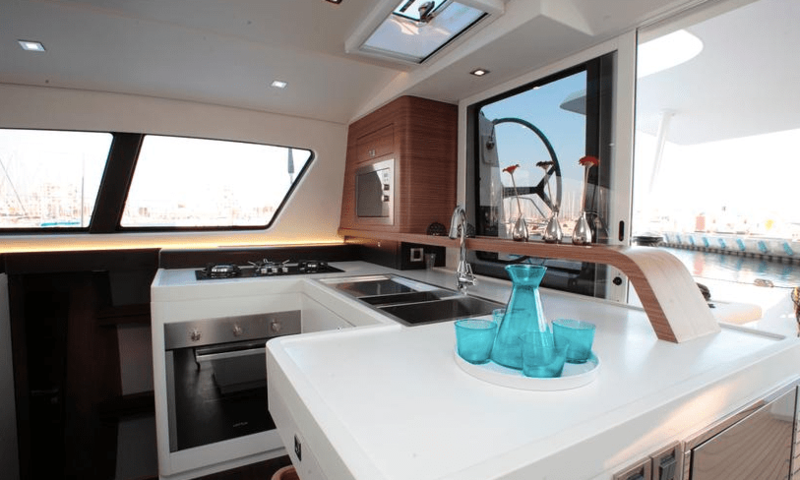 We really liked the interior layout of our Catana 471, and the 5X is very similar. The differences are definitely improvements that come from Outremer working closely with their owners over the years. They have kept all of the essential design elements that we like, and added some new ones that we can’t wait to try out! 5X Navigation station. Almost the same layout as our Catana, which we loved. The 5X has bigger windows and a lot more visibility when sitting at the Nav station. Lagoon nav station. Obviously not something that charter folks want to deal with! Nice use of sharp corners though. So while the 5X doesn’t have all the vacation condo bells and whistles of the Lagoon, it does an excellent job of providing comfort, safety and not a small amount of luxury at sea. I think we can check the box for Robin! And the 5X scrubs up pretty well for a night out on the town! I can’t wait to see the finished product. I love the “no sharp edges” concept. Misti and myself wish you all the best with the new Cat. Outremer have got a great reputation, at 13500kg she should be super fast.My favorite boat of all time is the old Outremer 55 light. I like the options you have gone for and you are absolutely right in keeping things simple. Once again all the best and keep us posted as to the build progress. Thanks for the feedback guys, I’ll keep you posted for sure. Clive, I remember you telling me about the Outremer 55 when we were in Cairns on our voyage north, which is why I kept an eye on what they were doing with their new models. Thanks for the advice! Very interesting comparison to the Lagoon! Super excited for your whole family and Sea Child looks forward to playing with Wildling in the Med!! Hi Eric and Tamara, it’s a great adventure, and we’re all really looking forward to sailing with you guys again! Doug, I get up to Brissie regularly and I’m very interested in buying you a coffee if you’re around. 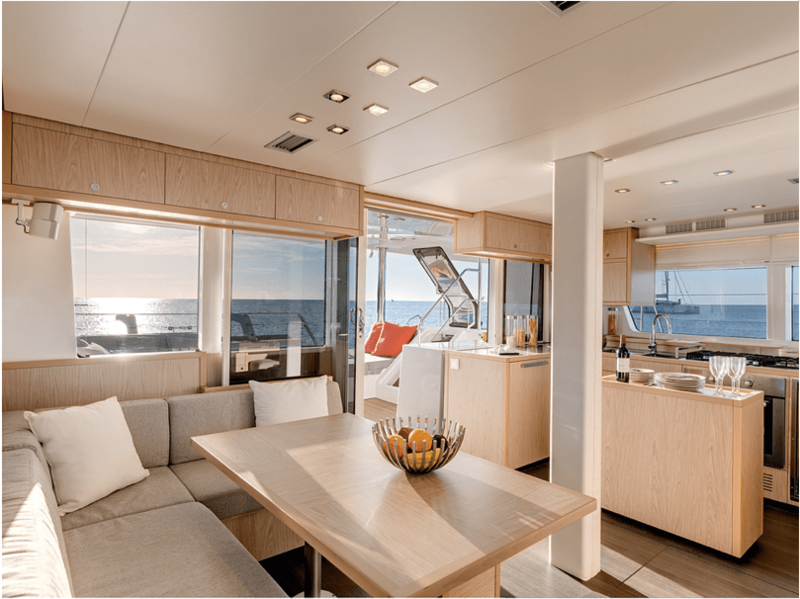 Like to ask you more questions about Outremer and why – it’s certainly looks like a great choice. Hi Tim, I’m always happy to talk about sailboats! Let me know when you’re in town. I have many questions to ask and would like to know how best to write to you directly ? I also keen to learn from highly experienced sailors and would like to know if it is possible to get time ( say up to maxi 4 weeks, or 1-2 weeks ) on-board to learn, as a crew member ? ” must” to learn from . Hi Stasi, thanks for the great feedback on the blog, I’m glad you find it interesting! Good luck with your cruising plans, and please send me any questions you have and I will try my best to help. Congratulations for your new and really nice Outremer! I have a 2013 Lagoon 52. I sailed her around the Caribbean and for sure, her performances are not even similar to Outremer´s but I manage to sail 200 to 250 NM every 24 h. The flybridge is not so bad… From Grenada to Panama, January 2016, we spent three days with 30+ knots winds bursting 40´s in front of the Colombian coast, 15 to 20 feet waves, and it was safe, dry, confortable and we could even sleep there… Speed was not astonish but we did an average of 11-12 knots over ground with two reefs in the mainsail and 60% of the self tacking jib (east current sure helped us). Sometimes we reached 18 knots surfing and we rolled the jib completely to stop the boat… Second night we cooked a Mahi-Mahi in the oven, opened two Viña Esmeralda bottles of excellent spanish white wine and enjoyed the night watching the boat relaxing around the cockpit table. I think in strong conditions, all cats will go fast, and it’s more a matter of slowing the boat down to a safe and comfortable speed. In these conditions, the most important is that the boat is strong and seaworthy, which your Lagoon certainly is! 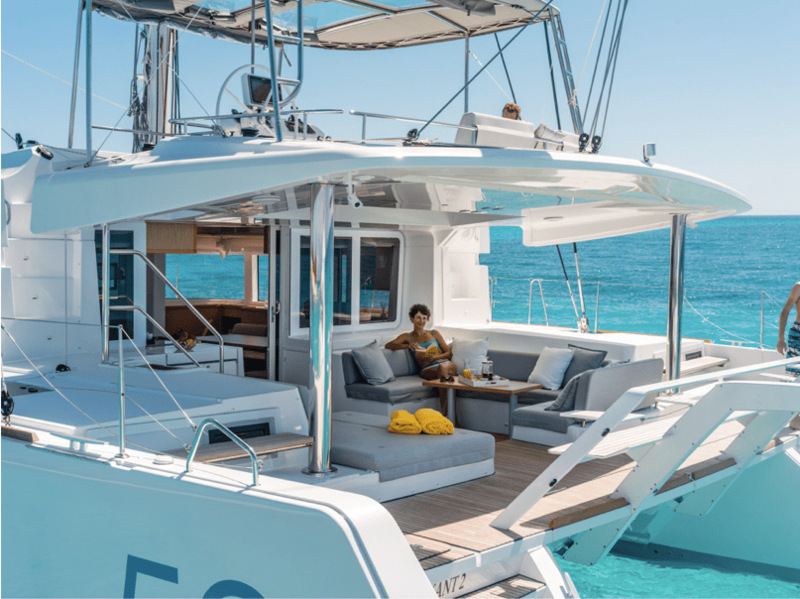 There’s a reason why Lagoon has sold more catamarans than any other manufacturer, and when you get up over 50 feet, you have a very comfortable platform for world cruising. Fantastic blog in general, top notch info! You compared the 5X to other brands and especially Catana, what about the outremer 51? I do not know if the 51 was available when you bought the 5x, but would you still have gone with 5X would the 51 been available at the time? In general, what do you think of the 51 in comparison with the 5X? I would still choose the 5X over the 51, but I do like the 51 a lot! The new changes are really nice, and will make the 51, I believe, very hard to beat. It’s a great blend of space, comfort, and performance. The main tradeoff with Outremer in general is they have less interior space for the same length as more traditional catamarans. To get the room we wanted, we needed the 5X, and that hasn’t really changed. Great to receive your update its been a while and I am always looking out for your blog and videos. I have been working on my Catamaran selection and have short listed it down between Outremer ( X5 and Seawind 1600 ( 54 ft ) . Seawind ticks all the boxes you have mentioned performance, reliability , safety and comfort , it is an Australian brand with their manufacturing facility in HCM, Vietnam . The X5 is a beautiful boat , engineered to great detail and quality. Hard to beat . Hi Stasi, be careful of the Seawind. It’s a nice boat, but very heavy, so it will not compare to the Outremer in terms of sailing performance. It will be a very comfortable boat though, just depends on your trade-off priorities. Digital switching – I would never choose to install this on a boat. Yes, I know it saves wiring and weight, but in my opinion the added complexity isn’t worth it. Our Catana had this, and it was a major headache. When something goes wrong, and you can’t switch a pump or your refrigerator on (or off), it’s very difficult to find the problem and fix it. Standard wiring, circuit breakers and manual switches are simple, reliable, and easy to troubleshoot if there’s a problem. One of my requirements for Wildling was no digital switching, and I have not regretted that choice for an instant. AC powered Watermakers: You can get watermakers in AC only, DC only, or dual mode. Take a look at the Spectra Newport for example. It makes no sense to get an AC powered watermaker. Yes, I know that to get high capacity you have to go AC, but even then you’re better off with DC, and installing more than one if you need more capacity. A DC watermaker only needs a connection to the battery bank to run. An AC needs an inverter or a generator to run. If you go with AC, you’ve just added a potential point of failure between your power source and your water supply. Diesel Generators: I really don’t like diesel engines, but in particular I hate diesel generators with a passion. They are heavy, noisy, vibrating beasts that take up a lot of space, and require constant maintenance and repairs. Usually they are only there to run high power consuming equipment that could have probably been left off the boat in the first place (see AC watermakers above, but also air conditioning, dish washers, clothes washers, dive compressors, etc.). If you have a super yacht, fair enough, but if your objective is to cross oceans under sail, then generators are a bad idea, and (IMO) unnecessary. If you install 700-1000 watts of solar, a hydro or wind gen and large enough (100 Amp or so) alternators, you have more than enough power to run a sailboat. Also, think about when you really need to run high energy systems. We have found that air conditioning is only really needed in a marina, so we installed A/C on our boat that runs when we have a shore power connection. No generator needed, and A/C available when it’s really required.